Socks perform three vital functions. First, they cushion the feet from the shocks and the abrasions due to hiking; second, they wick sweat away from the feet keeping them dry; and third, they provide warmth and comfort. My three favorite types of socks are shown. 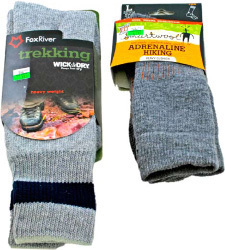 The pair on the left is a thin wicking sock; the middle pair is a middleweight hiking or trekking sock. The pair on the right is a heavyweight pair of wool socks. Wicking socks help keep your feet dry. Wet feet catch the foot against the inner boot and this friction may cause painful blisters. Dry feet have less friction and that allows the sock and inner boot material to slide harmlessly over the foot. 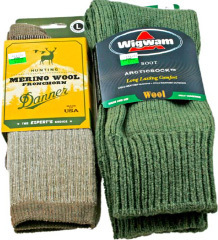 Wicking socks are usually made from polypropylene and wool. Cotton socks do not wick away moisture and your feet are more likely to become moist and subject to the friction causing blisters. Cotton socks should be avoided. Also, once wet, cotton socks don’t insulate, and your feet will become cold. Wet cotton socks no longer cushion the feet. Cool Max is a good choice for a sock material. It’s a mixture of polyester and nylon and just a bit of cotton and acrylic. Cool Max is breathable and readily wicks moisture away. 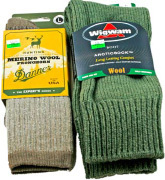 Wool is also a good choice because it wicks and provides cushioning. Some nylon must be added to make wool socks more durable. I prefer a lightweight sock that is beefed up under the sole, toe, and heel areas so it cushions most where it’s needed and is thinner elsewhere over the ankle and the top of the foot. With these my feet stay drier because they do not heat up as much. Drier feet have fewer blisters and are more comfortable. 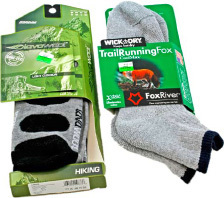 Also shown is a pair of three season socks commonly referred to as a hiking or trekking sock. These are the middleweight pair of socks; they are thicker and have added cushioning abilities. They also help fill up the space between your foot and the inside of your shoe. 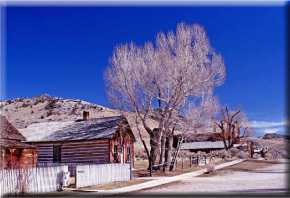 Most of the time I will carry a pair of hiking socks and a lightweight pair of wicking socks. I will start out wearing the thicker hiking socks and for the last half of the hike I will switch over to the thinner wicking sock. It seems that as I hike my feet swell up a half size larger. If I stayed with the heavier trekking sock, my feet would be jammed up inside the shoe bed causing heat, moisture, and blisters. By changing to the thinner pair, I compensate for my swollen feet and maintain comfort. When I change over midway through my hike, I cannot believe the difference it makes. Winter socks are thicker and provide additional insulation. They are worn over a pair of thinner wicking socks. I only wear them with my winter boots so I purchase my winter boots in a larger size to compensate for these thicker winter socks. Socks which are too thick for your boots cut down the circulation causing cold feet. These heavier wool socks are worn with my pack boots, hip boots, and sorrels. Socks should be kept clean. They are easily washed by hand and are fast drying. Once I change socks from the trail, I wash them immediately in cold water with either a biodegradable soap or simply no soap at all. I wring them out and hang them from the back of my pack to dry. Each foot has about a quarter of a million sweat glands. They can provide up to a pint of sweat in a day. This is why you need socks that don’t absorb moisture. Hence, breathable footwear and wicking socks are a must. 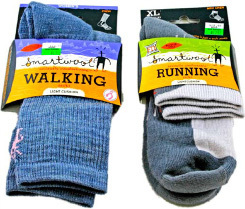 Lightweight socks made from wool and synthetic materials work well in cold and wet conditions. Yes, your shoes and socks will become wet, but they will be surprisingly warm due to the exertion of hiking and once the hiking or rain has stopped, your shoes and socks soon dry. Hiking briskly keeps your feet warm. Cold feet are due to footwear that fits too tightly and cuts off circulation. flexible soles and in my opinion are perfect for hiking in most conditions. They are well cushioned; the mid-foot and the heel strike zone areas provide extra cushioning for the repeated strikes of hiking. Running shoes quickly break in while heavy leather boots take forever to break in and cause painful blisters and calluses. Running shoes tread softly on the environment for minimal impact. This preserves the fragile soils and flora. Running shoes are more comfortable in the rain than heavy leather boots. 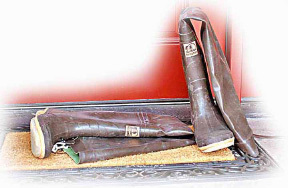 Once soaked, leather boots can take days to dry out while soaked running shoes dry quickly. Their flexibility while wet prevents soreness. Our feet are waterproof and don’t mind being used when wet. Although cold can become a problem, active hiking keeps them warm. When you stop hiking it is time to dry out the feet, shoes, and socks. Running shoes dry out faster than other types of footwear. Ankle support is a fallacy. I prefer low top running shoes. 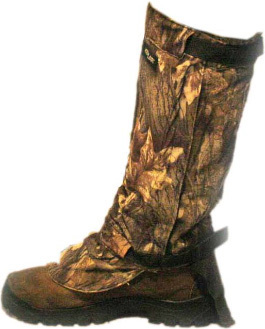 Boots with stiff ankle supports cause the stresses of the trail to be placed on the fragile knee and hip joints. Knee and hip injuries are serious injuries that can take a long time to heal. Stiff ankle support also restricts the natural range of motion of your ankle joint. This can cause you to lose your balance and fall. I prefer the running shoe for about 80% of my hiking. There are only a few instances that I use other footwear. 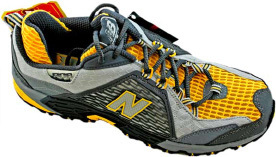 Some running shoes are designed for hiking. These have soles that are a little more aggressive in tread design and provide better traction on wet, slippery surfaces. 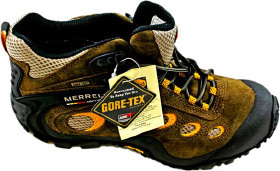 In addition, they are made of Gore-Tex and are both watertight and breathable. This is an advantage on wet trails. You enjoy drier feet and improved traction. The added benefit is in durability and traction. 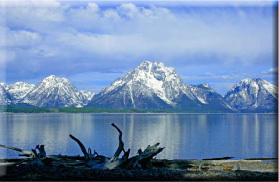 Trekking sandals are amphibious sandals and are preferred by kayakers and desert travelers. A strapping holds the sandals in place and an arch support helps to make them more comfortable. 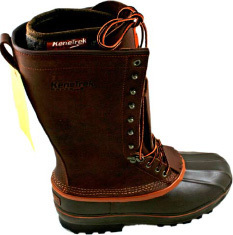 They are useful in wet conditions and in day hiking on well groomed trails. Sandals are also great for wearing around camp, especially after a long hike. They help to air out your feet and furnish a refreshing change. Leather boots provide ankle support. I’ve worn mine after I sustained an ankle injury. This helps the healing process. Also, I use my boots while hiking in rattlesnake and in thorn country. They protect me from the cactus needles and a potential snake bike. I dislike them for long hikes because they are uncomfortable and taxing on a long trail. They cause stress on my tendons and muscles, and I’m more likely to sustain a fall because they immobilize the balancing movements of the ankle joint. Hip boots are preferred for the coastal rain forests. 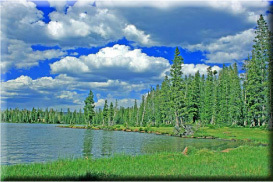 Here the wet vegetation can quickly soak through your pant legs. They’re also great for wading in the many mud puddles and crossing the small streams. I wear a pair of heavy wool socks and change when they are damp. A wicking liner sock is also helpful. Felt soles aide in traction on wet slippery rocks. Cleated soles are best for mud traction. Hip boots are essential for coastal rainforests of the Pacific Northwest. 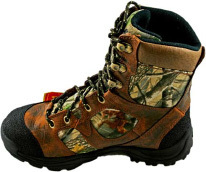 Hip boots are useful for fishing in small streams and crossings where the water is not too deep. During severe rainstorms they also keep your legs and feet dry. Pack boots are totally waterproof and heavily insulated. I like them for snowshoeing and hiking in cold, snowy terrain. They are also good for sitting around while ice fishing, or on a winter camp. I dislike hiking long distances in them because their weight can become taxing. Their waterproofing can make your feet perspire and your socks damp. This causes cold feet. I buy mine nearly a size larger than normal and compensate with a lightweight wicking sock and a heavy weight wool sock. Sorrels are the warmest boots for the most severe conditions. They have a heavy thick felt wool liner that wicks away moisture and provides a thick layer of insulation for warmth. Also they have built in high tops that allow you to tread in deep snow, although the distance I can hike is limited by their heavy weight. They provide excellent cushioning and I have yet to wear a blister wearing a sorrel boot. These are great for late season football games where you sit for hours and useful for ice fishing and tramping through deep snow. Sorrels are my favorite boots for cold weather trips. When hiking in rattlesnake country, I’m wary of snakes and being bitten. Rattlesnake country also seems to have its share of thorns. Over the years I’ve had many rattlesnake encounters. I’ve been struck four times. Each time I’ve been protected by my footwear. The first time was when a snake’s fangs embedded itself into my tennis shoe heel. The last three bites were to my Kevlar Snake Gators. I feel secure in snake country wearing my gators along with a heavy leather boot. Now I enjoy the hike without constantly looking out for snakes. Also I like to use my trekking poles; they not only provide balance, they tap the ground warning the snake. This allows the snake to move away and prevents an encounter. Holding the poles keeps my hands high off the ground and out of the reach of a snake. The only body part exposed to a snake is my armored footwear. The boots and leggings also protect me from the many thorns that thrive in the desert environment. Even cactus cannot penetrate the Kevlar and heavy leather boots.